I love garage sales. You never know what wonderful treasures you might happen upon. I have been clothing my kids with garage sale finds since before they were born, well you know what I mean. We bought back Tristen's infant gowns, which we had sold in a sale, at a garage sale when we were expecting Ashley...they still had his name written on the tags! 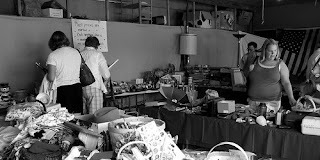 We've bought wonderful books, toys, furniture, appliances, knick knacks, and everything else under the sun at yard sales. I love when spring arrives because I know the great sales will be starting up. The whole family enjoys shopping this way. Lynette, her mother, and I can make a morning of sale shopping. I cannot say enough about how much I enjoy scoring great deals at garage sales! I think I may be addicted! But, having a garage sale is an entirely different animal. We are having one this weekend and I've been preparing for it all week. It's after 11:00pm and we are still pricing, making signs, and go through things to put out. In a way I am really enjoying the purging of clutter from my home. on the other hand, I am one tired mama. We've been blessed with wonderful neighbors who have generously been helping us out. I don't know what we'd do without friends! Anyway, I am hoping that we will be all set come morning. I am also hoping we actually get some sleep tonight. So, look forward to me sharing my best tips for having a great garage sale in the next couple of days. Right now, I have to get back to my price tags. Ashley's outgrown clothes are calling my name.